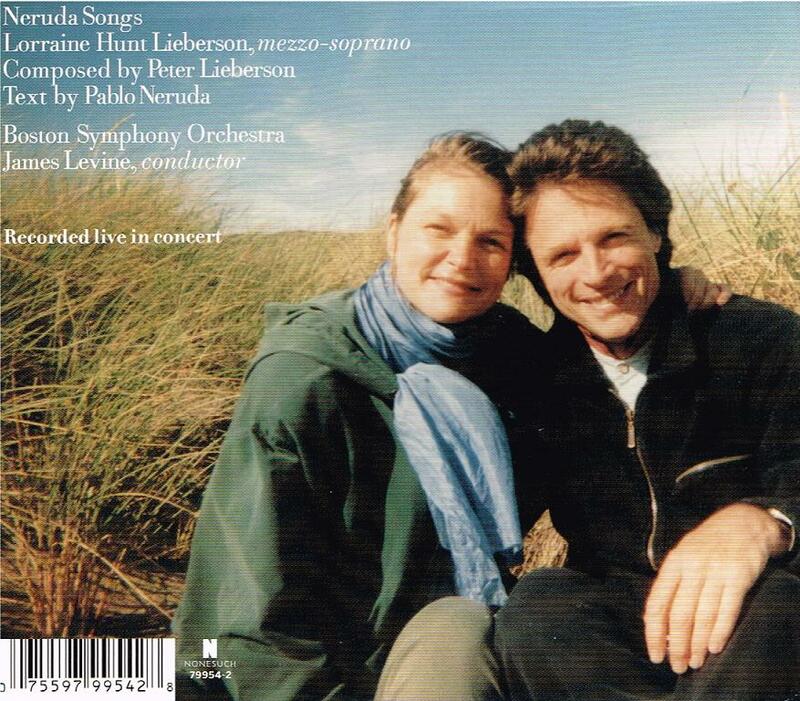 "The history of Peter Lieberson's Neruda Songs is so freighted with emotion that it's difficult to listen to them with any objectivity. The great Chilean poet Pablo Neruda wrote 100 Love Sonnets (1960) for Matilde Urrutia, who later became his wife, and Peter Lieberson set five of them for his wife, mezzo-soprano Lorraine Hunt Lieberson. Lieberson's settings grew out of a full understanding of his wife's extraordinary vocal and dramatic gifts and are suffused with his intimate awareness of her personal and artistic vitality, as well as the fragility of her physical health. 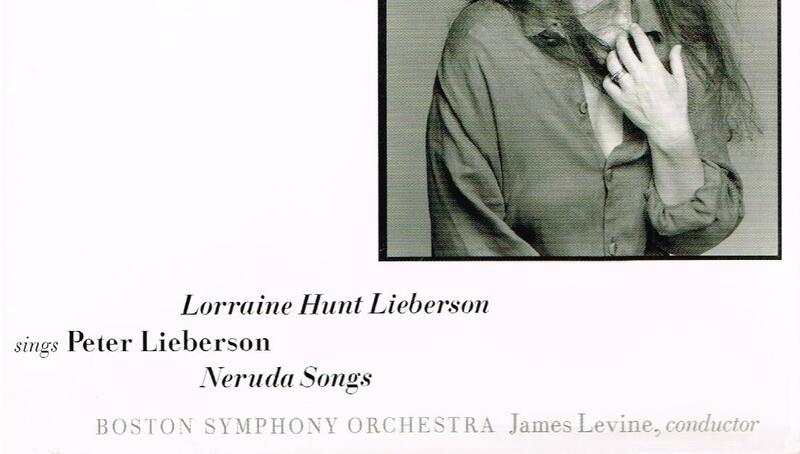 Hunt Lieberson gave the premiere of the Neruda Songs in Los Angeles in May 2005 and recorded them with the Boston Symphony under James Levine in November that year. She died in July 2006. The listener is always aware of the generosity of the husband and wife, composer and singer, in being allowed to participate in the intimacy of their final love song to each other. Lieberson's musical style, which since the beginning of his relationship with Hunt Lieberson had broadened to incorporate a richer harmonic vocabulary along with a heightened awareness of the importance of melody, reaches a new level of lyric and dramatic intensity in these songs. One hesitates to use the word Romantic to describe his new musical language, because the word implies looking backward rather than moving forward. It would be more accurate to characterize Lieberson's new work as freer, less cerebral, and more open to intuition while retaining his impeccable craftsmanship, exquisitely colorful orchestration, and discerning critical ear. The vocal lines are deeply personal and inevitable expressions of the texts, with each note precisely and passionately placed, taking full advantage of the breadth of Hunt Lieberson's expressive abilities. While the themes of several of the poems include the death of the beloved, and the fear of loss or separation, the overriding musical tone of the cycle is not tragedy, but tenderness. The final song, ‘My love, if I die and you don't’, is a gentle exhortation not to grieve that concludes: ‘But Love, this love has not ended: just as it never had a birth, it has no death; it is like a long river, only changing lands, and changing lips’. Lieberson ends the cycle by floating the word ‘amor’ repeatedly over a tranquil orchestral murmur. “The mezzo-soprano Lorraine Hunt Lieberson, who won near universal praise from critics and audiences for her courageous, insightful and deeply affecting artistry, had a maverick career. She brought uncompromising integrity to her choice of roles and repertory, was a champion of Baroque operas and of living composers, and preferred to work in close-knit conditions with directors and ensembles who shared her artistic aims, especially at festivals like Glyndebourne in England and Aix-en-Provence in France….few artists have brought such emotional vulnerability to their work. That she began her professional life as a freelance violist and did not focus fully on singing until she was 26 may account for the musical depth and intelligence of her vocal artistry. One of her closest colleagues, Craig Smith, the Boston-based conductor and choir director, said as much in a 2004 profile of Ms. Hunt Lieberson by Charles Michener in the NEW YORKER. 'There's something viola-like about the rich graininess of her singing, about her ability to sound a tone from nothing’, he was quoted as saying. Though her work seldom drew less than raves from critics, her singing eluded description. Despite the gleaming richness of her sound, her voice somehow conveyed poignant intimacy. Although she paid scrupulous attention to rhythm, phrasing and text, she came across as utterly spontaneous. Her person disappeared into her performances. And yet in a Handel aria, a Britten cantata or a song by her husband, she could be so revealing you sometimes wanted to avert your eyes for fear of intruding. Her second appearance in a Met production came in 2003 when she sang the role of Dido in the new staging of Berlioz's epic LES TROYENS. With this luminous, stylistically informed and emotionally true portrayal she showed that she could galvanize the Met's stage in a major role. She studied voice and viola at San Jose State University and, upon graduation, became a freelance player in the Bay Area noted for her expertise in contemporary music. When a French horn player she was dating got a job with the Boston Symphony Orchestra, she moved with him to Boston, soon becoming a valued freelance musician. She was particularly drawn to the music program at Emmanuel Church in the Back Bay section of Boston, where Mr. Smith conducted the orchestra and choir. For the next decade her career thrived as she collaborated with the early-music conductor Nicholas McGegan and the Philharmonia Baroque Orchestra on a series of Harmonia Mundi recordings of Handel operas and oratorios.